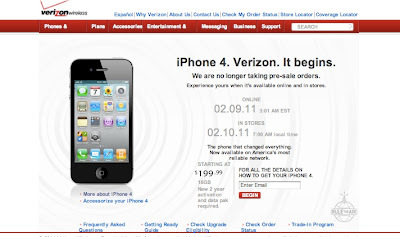 In less than 19 hours, Verizon has stopped taking any iPhone 4 pre-sale orders. Only Verizon customers were eligible to take advantage of the pre-sale. 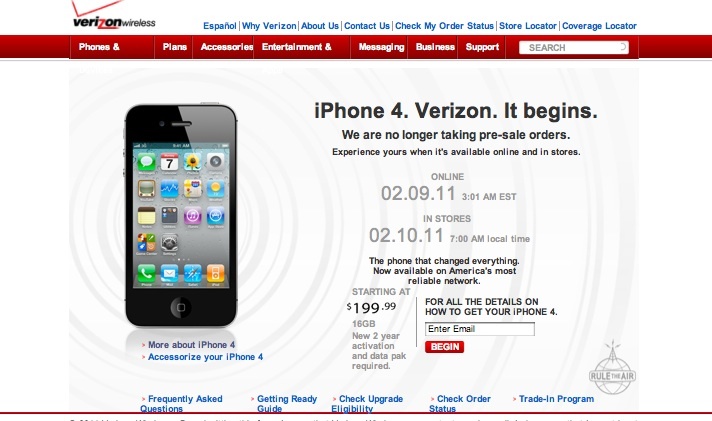 It is unclear how many iPhones Verizon actually sold during this pre-sale event. Those Verizon customers that were lucky to place their pre-sale order will receive their new iPhones next week on February 10th. Verizon will start taking new iPhone orders online on February 9th at 3:01 AM EST and in-stores on February 10th at 7:00 AM local time. Target's new electronics trade-in trade-up program makes it easy and affordable to upgrade to the new iPhone 4, Apple iPod, Motorola Droid and video games at 847 stores. 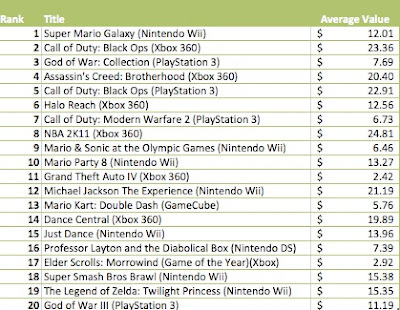 For the week ending, January 29, 2011 the Top Twenty most sought after video game trade-ins are shown below. 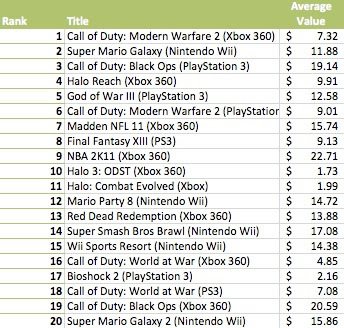 Call of Duty Modern Warfare 2 (XBOX 360) tops the charts this week. Super Mario Galaxy ( Ninetendo Wii) continues to be one of the most popular trade-ins. 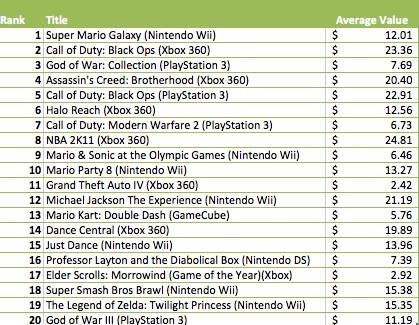 NextWorth continues to offer top value for video games. Trade-in online or at a nearby Target store. Starting this week we are going to publish the Top Twenty most sought after video game trade-ins. Our list will give you the average trade-in value. This past couple of weeks, NextWorth has dramatically increased its video game selection to over 7,000 games. The differences between the iPhone 4 offered by AT&T and Verizon are very subtle.It is obvious that Apple did this on purpose. 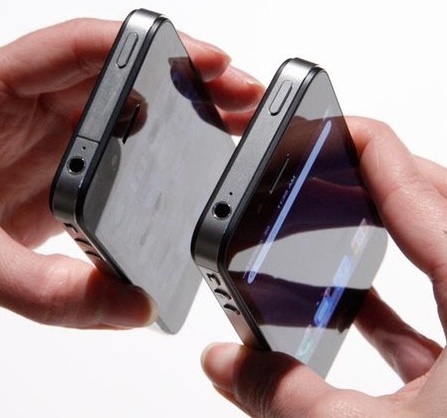 Both phones have the same dimensions. The Verizon Phone can create a WiFi network for up to 5 devices. While unconfirmed thisseems to be available for only the iPhone 4 32GB. Different antennas. The antenna gap has moved on the side of the device, above the muteswitch, while the bottom antenna gap remains in the same place. This should help reducethe “grip of death” syndrome that the AT&T iPhone 4 experienced. Another major consideration to take into account when selecting between the AT&T and Verizon iPhone 4 is the cost of the data plans offered by the two carriers. Verizon offers based on current data plans for other smartphones: $15 for 150MB; $29.99 for unlimited; $49.99 for unlimited with tethering. One last thing to think about is when selecting between the two carriers which iPhone will offer the best trade-in value at the end of two years. History shows the Apple iPhones retains its value better than other smartphones. However the Verizon phone with its CDMA antenna can not be as easily resold for use in many other US or international markets. Most international markets currently use GSM vs CDMA technology. Therefore, at the end of 2Previewyears, an AT&T iPhone 4 may have a slightly higher value. So its time to Trade-in and Save Big. Don't wait and miss out on the highest trade-in values now being offered. If you wait, you will miss these great values.